1. Beat eggs with a fork. Add salmon and break up. Stir in apple, bread crumbs, onions, mayonnaise, curry powder, paprika, and pepper. Shape into four cakes (3/4 in. thick); place on a piece of plastic wrap. 2. Set a 12-inch nonstick frying pan over medium heat. 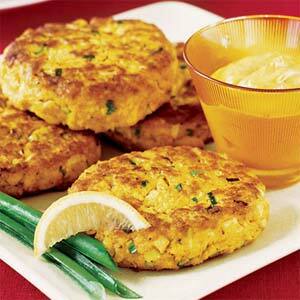 When hot, add oil, then salmon cakes. Cook until well browned on the bottom, 5 to 7 minutes. Turn cakes over and cook until browned on the other side, 3 to 5 minutes longer. 3. Serve cakes with aioli.